A BMW convertible is a unique and classy vehicle. It has very attractive styling that attracts your eyes (and those of others) to it. You’ll look very good behind the wheel of a BMW Convertible. And even better, you will love driving it. After all, it’s The Ultimate Driving Machine! If you have seen the sticker prices, you may have thought that BMW convertibles are very expensive. But that’s not true if you lease one! Below, we have listed the presently available BMW convertible lease deals. To keep it simple, we have selected the rear-wheel drive models. If you live in a place where you need all-wheel drive, the xDrive versions also have their own lease deals. The comparable all-wheel drive models run around $20 to $30 additional per month. Even though it is October, there are still great deals on both the remaining 2017 leftover BMW convertibles and the similar incoming new 2018 BMW convertibles. While there are lease deals on both, the 2017s will be less expensive. Because they have lower monthly payments, we will focus on the 2017 models that are still available, and the 2018 models in the cases where the 2017s have sold out. Of our eight BMW Convertible lease deals for October, three are 2017s and five are 2018s. Each of these leases allows you to drive up to 10,000 miles per year, for a total of 30,000 miles over the 36-month term of the lease. 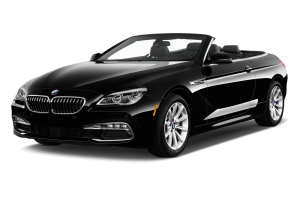 Take a look at these great BMW convertible lease deals for October! 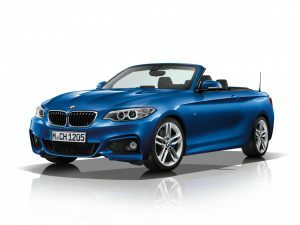 The 2017 BMW 230i Convertible is small and intimate, very similar to the legendary BMW Convertibles of the 1980s and 1990s. The 2.0L turbocharged four-cylinder engine puts out a more-than-adequate 248 horsepower. It’s perfectly sized, just right for carving up canyon roads or cruising down the highway, and has a real sports-car feel. The 230i in this deal comes well equipped with items including the Driver Assistance Package (with rear view camera and park distance control) and metallic paint. This offer is good through 10/31/17. The 2017 BMW M240i Convertible is similar to the 230i, but with a major upgrade in performance. The M240i receives BMW’s 3.0L twin-turbo six-cylinder engine that churns out a whopping 335 horsepower, which makes this a high-performance compact convertible that is comparable, in both size and power, to the revered M3 models of the past. Zero to 60 mph takes just over four seconds. The car in this lease deal also comes with the Driver Assistance Package and metallic paint. This M240i Convertible lease offer is good through 10/31/17. The Essentials Package includes keyless entry, park distance control and SiriusXM Satellite Radio with 1-year subscription. The Premium Package includes lumbar support, heated front seats, navigation system, advanced real-time traffic information, remote services and instrument cluster with extended contents. This lease offer expires 10/31/17. The 2018 BMW 440i Convertible is very similar to the 430i, but gets an engine upgrade similar to that of the M240i above. In the 440i, the 3.0L twin-turbo six-cylinder provides 320 horsepower, a 72 horsepower increase over the 430i for an additional $90 per month. Paddle shifters give you instant control over all that power. The 440i also comes with the Essentials Package, the Premium Package and metallic paint. This lease deal expires 10/31/17. The 2018 BMW M4 Convertible is a major step up from the 440i, with a monthly payment that is $290 more. The difference in sticker prices has something to do with this: the M4’s MSRP is $80,595, and the 440i is $62,045, an almost $20,000 difference! But if you would like the highest-performing 4 Series, with its 425-horsepower 3.0L high-pressure twin-turbo engine, active differential, 10-way power sport seats, and carbon fiber body parts, leasing is the most cost-effective way to enjoy it! The M4 Convertible in this lease deal includes the Executive Package, Park Distance Control and metallic paint. The Executive Package includes Icon adaptive full LED headlights, automatic high beams, side and top view cameras, parking assistant, head-up display and speed limit info. Offer is good through 10/31/17. This offer is effective through 10/31/17. Just for reference, the 650i Convertible in this offer has an MSRP of $100,995, so a monthly lease payment of $1,259 is not bad in that context! This offer is good through 10/31/17. The 2018 BMW M6 Convertible is the top-of-the-line BMW performance convertible. Powered by a 4.4L, 560-horsepower high-pressure twin-turbo V8, the M6 Convertible goes from zero to 60 mph in only 4.3 seconds. Choose from a six-speed manual or a seven-speed double clutch automatic transmission. There are many luxury touches, from the 20-way power multi-contour seats covered in Merino leather to the 600-watt, 12-speaker Harman Kardon surround sound audio system. The Driving Assistance Package and metallic paint are also included on the car in this offer, which runs through 10/31/17. As a smart lease deal shopper, you should be aware of all the costs involved in a lease deal, not just the monthly payment and the “due at signing” amount in the ad. The fine print at the bottom of each offer will tell you the whole story. You can find all the fine print on these BMW Convertible lease deals here. If there is something you don’t understand, ask for a complete explanation. Enjoy the experience!